IN his continuing search for the more weird, wacky and wondrous in the world of travel, David Ellis says young actors who've played the part of feisty langur monkeys in village stage shows in India, are being retained by the government to play make-believe langurs in capital New Delhi to scare-off red-faced macaque monkeys that have become a major violence and health problem. 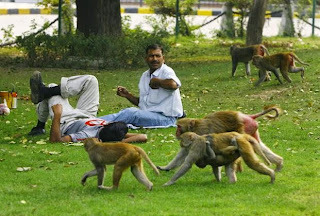 Tens of thousands of macaques roam freely in New Delhi, brazenly stealing food from tables, shelves and even refrigerators in homes, shops and restaurants, and in one school yard recently slapping youngsters about their faces and bodies to make off with lunchtime food and drink. And so aggressive were five macaques that attacked a terrified woman preparing dinner in her home last month, that police called to rescue her had to beat the animals off with bamboo poles. 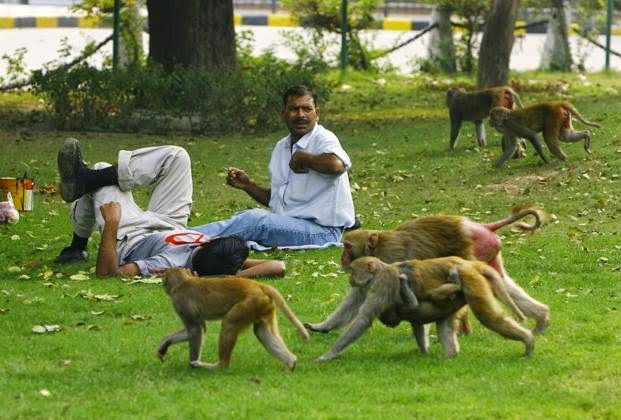 Even the capital's Parliament House is not immune from attack, with the macaques snatching files from the hands of politicians and bureaucrats in offices and corridors in the belief they are food. Now with treatment for monkey bites second-only to dog bites at New Delhi's hospitals, the government has retained 40 young people to lope langur-like amongst the macaques, thrashing their arms and making the shrill sounds of angry langurs – that are the macaque's major natural enemy – in the hope of scaring the little red-faced critters back into the jungle. If this doesn't work, the next step could be to have park rangers fire-on the macaques with rubber bullets.